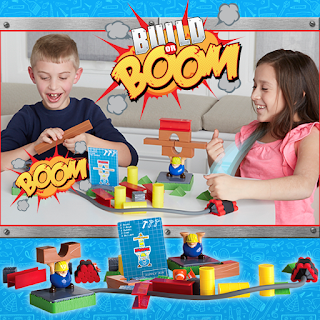 Introducing Build or Boom – Goliath's newest game that lets boys AND girls play! Parents and educators are learning that it’s important to let boys and girls explore and figure out what they want to be and how they contribute to the world, without gender stereotypes or filters. 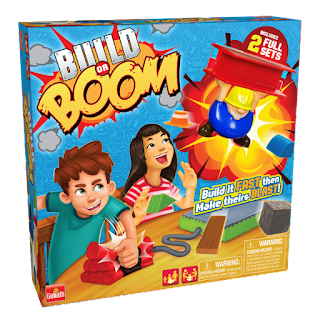 In play testing we found that Build or Boom does just that. The best part of this game is the educational benefits masked as fun. Build or Boom helps reinforce STEM skills such as analytical thinking and shape recognition. In addition, eye-hand coordination and deductive reasoning help build foundational skills. STEM is such a huge part of children's education right now, and to have a super fun game that promotes such healthy brain function is always a bonus! As an educator I know how important it is to keep these little brains growing and absorbing and with Goliath Games there is so much for kids to experience and enjoy! Great game the kids were laughing for hours!